Many people see American cities as a radical departure in the history of town planning because of their planned nature based on the geometrical division of the land. However, other cities of the world also began as planned towns with geometric layouts so American cities are not unique. Why did the regular grid come to so pervasively characterize American urbanism? Are American cities really so different? 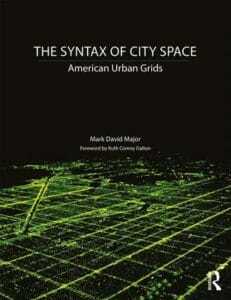 The Syntax of City Space: American Urban Grids by Mark David Major with Foreword by Ruth Conroy Dalton (co-editor of Take One Building) answers these questions and much more by exploring the urban morphology of American cities. It argues American cities do represent a radical departure in the history of town planning while, simultaneously, still being subject to the same processes linking the urban network and function found in other types of cities around the world. A historical preference for regularity in town planning had a profound influence on American urbanism, which endures to this day. Available now from Routledge/Taylor & Francis, Amazon, Waterstones, Foyles and other online retailers! 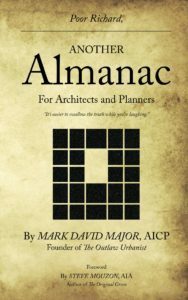 Poor Richard, Yet Another Almanac for Architects and Planners (Volume 3) offers more common sense proverbs, astute observations, and general rules of thumbs about architecture, urban design, town planning, and much more in the third and final volume of the Poor Richard series. Author Mark David Major blends original ideas with adapted wisdom in an easy-to-read manner designed to spark deeper thought about hearth and home, streets and cities, and people and society. 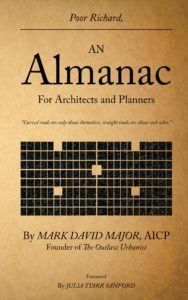 It is essential reading for anyone interested in the future of the built environment. Poor Richard’s witticisms are often eloquent, sometimes biting, occasionally opaque in the absence of reflection, and always insightful. They offer a valuable resource for the entire year. A clarion call and warning for everyone involved in the creation of our built environments to embrace their better angels and reject the worse demons of human nature. 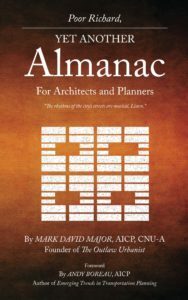 The clear message of Poor Richard, Yet Another Almanac for Architects and Planners (Volume 3), with foreword by Andy Boenau (author of Emerging Trends in Transportation Planning), is we can do better and we must do better for the built environment and our cities. 148 pages with black and white illustrations. Available in print from Amazon, CreateSpace, and other online retailers. Available on iBooks from the Apple iTunes Store. Available on Kindle in the Kindle Store (newly reformatted for Kindle devices). Drawing inspiration from Benjamin Franklin, Thomas Jefferson and many others, Major crafts anew general rules of thumb for anyone interested in the architecture, urban design and planning of our cities. The result is marked as much by its breadth and depth as the brevity of its words on the subject. According to leading New Urbanist architect Julia Starr Sanford, in her Foreword to Major’s Poor Richard, the book represents “genius, extraordinary wit, passion for good design and mastery of the history of planning (in a) hilariously righteous epitome of 21st century sense and sensibility.” The unmistakable message is we can do better for our cities, we must do better for our cities, and, before the 20th century, we did do better for our cities. 136 pages with black and white illustrations. Visit www.markdmajor.com to browse fiction titles and artwork available by Mark David Major.